Mark my words, I am a pickle addict. But my love of pickles wasn’t a loving culinary journey in the beginning. Vietnamese cuisine is a collage of fresh vegetables, layered flavors and diversity of textures. So pickles in all forms were always a key staple at our meals. As long as I could remember Mom and Dad would grow small white eggplants, mustard greens and other vegetables and pickle them till we ran out of glass jars. Pickling was an integral part of Mom’s kitchen life and if she did it, then so did we. As kids, we felt horribly abused and forced to the task of tending the garden and pickle duty. I hated pickle duty boot camp. Weeding the garden wasn’t nearly as torturous as washing the vegetables and preparing the brine for Mom’s pickles. For every hour we spent in the garden, we had one less hour playing Atari Pac-Man and Frogger. Back then, Atari was the blood that ran in our childhood circles, an addiction that had to be sufficed with at least 2 hours of Frogger or Pit-fall or else we’d suffer from non-video game syndrome. But when late Spring and Summer arrived, we were handed big colanders, a pair of clippers and our Atari was taken away. All six of us kids screamed abuse! Mutiny! Child slave labor! Then Dad would come out of his office with a loud growl. No words, just a growl. And then we’d all retreat to the garden with our tails between our legs. If we wanted to be fed, we had to help participate in the cooking process. We helped Mom pick eggplant and mustard greens. And lots of it. The kitchen sink was station #1 to wash. The dinner table was spread with newspaper and cutting boards. That was station #2. The counter-top of the final station #3 for the pickling and jarring. As the eldest child, I was the team leader and I told all my younger siblings that if we did this fast enough, there would be more Atari time for us all. That incentive was enough to get us all whistling to the seven dwarfs’ song. Within a few hours, we all bustled from the garden to the kitchen like well trained, industrious little dwarfs. At the end of the day, the counter top was lined with jars of beautiful pickles of all shapes and colors. Mom was proud and relieved to have pickles for the next 2 months and the six of us kids were racing to see which two would get the 2 Atari joy-sticks first. My Atari playing days are over, but ironically, my pickling days have just begun. For the last 2 years, I’ve been a manic pickler of all things crunchy. From homemade kim-chi to dill pickles to okra, I’m affectionately in love with the craft of pickling. If I have big batches of garden veggies that can’t be eaten quick enough, then guaranteed they’ll all be in a brine within a matter of hours. All those pickling days as a kid paid off considerably. Indeed they have. Just look in our garage and you’ll see what that pickling boot camp taught me. I’m thrilled with this particular pickling recipe from Sara Foster’s new book, Sara Foster’s Southern Kitchen. Sara has wonderful recipes and I’ve been pleased with all her recipes from her Market cookbook. 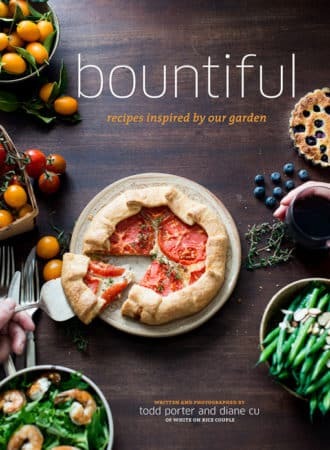 Her newest book has a terrific quick pickle recipe that is so bright, fresh and balanced, it’s so probably my favorite pickling recipe so far. Her recipe uses the juice of a whole lemon and I think that is what I’m so in love with. The bright citrus flavors really highlight my spring pickles from the garden. 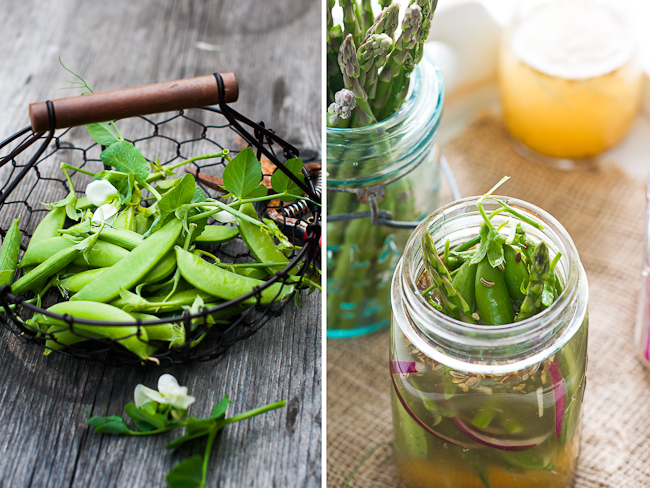 When Spring arrives, I love nothing more than to be able to pickle sugar snap peas from my garden and some fresh asparagus I find at the market. 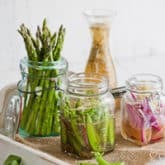 The combination of Sara’s versatile pickling brine, along with Spring’s love of peas and asparagus help me celebrate the arrival of this magnificent Spring season even more. I’m beyond excited for Spring and pickles. 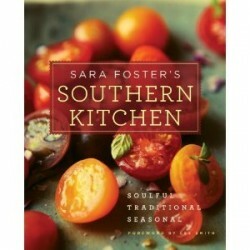 Adapted from Sara Foster's Southern Kitchen Cookbook. This recipe is great for quickly pickling your fresh vegetables. After an hour, everything is nicely pickled, but over time the flavor intensifies. Keeps well in the refrigerator for several weeks or preserve the pickles by canning them according to manufacturer instructions to keep longer. Makes about 1 pint of pickles. Combine pickle brine ingredients together in a medium bowl and mix well. 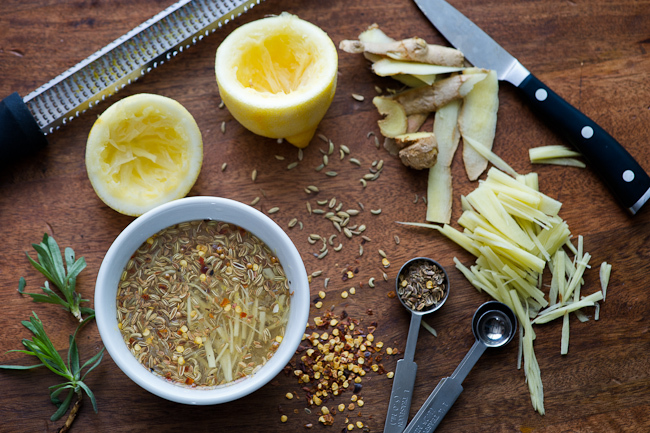 In whatever containers you are going to pickle into, scoop out the solids from the pickle brine (ginger, seeds) and divide between your containers. Arrange your pickling vegetables into your pickling containers. Then pour remainder of pickling brine over the vegetables to cover. Refrigerate for at least on hour, or can your pickles for later use. For my siblings and I, it was Pee-Wee’s Playhouse that we were forced to forego in the interest of gardening. It’s amazing how us children of “abuse” managed to grow up ok.
Mahalo for posting this!! This brine recipe you posted made awesomely delecious pickles!! I really enjoy reading your blog!! I stumbled upon your site, while searching snowpea recipes. OMG I love your blog! 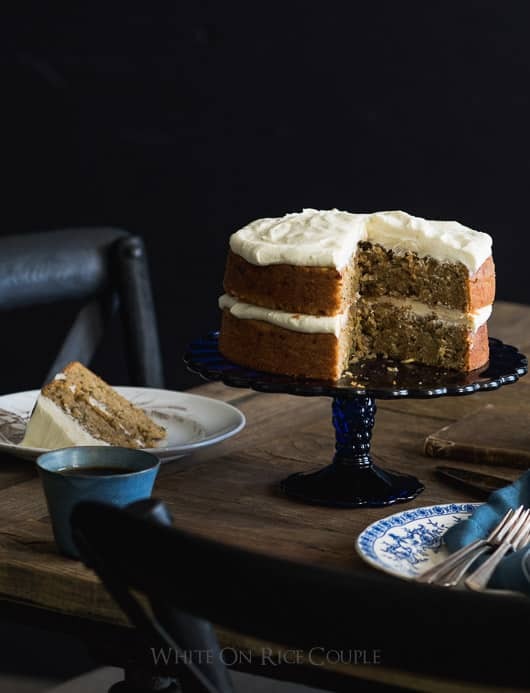 Such beautiful photographs and everything looks so delicious! Thanks for the excellent read this morning and the transporting photos. If only this Canadian snow would melt and spring pickles could also be on my to-do list. Ah, one can always dream. The first time I tried pickled asparagus I absolutely hated it…but this makes me want to try them again. And sweet peas?! 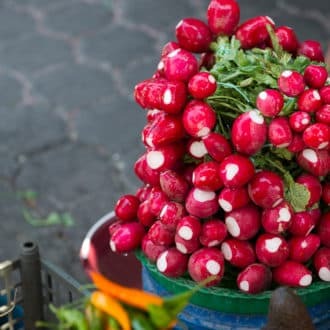 Never even thought about pickling those but it seems like it’d be a perfect balance between sweet and sour. It must be spring! Green and pickles are a sure sign. Love your blog as always! I love this story, so heartwarming. It’s it funny that the very things we hated when we were young that our parent forced us to do are the very things we love to do as adults? Your pickles are absolutely beautiful and so fresh. Have you made Dilly Beans yet? I just discovered them last summer and am obsessed with them. I love anything pickled though. 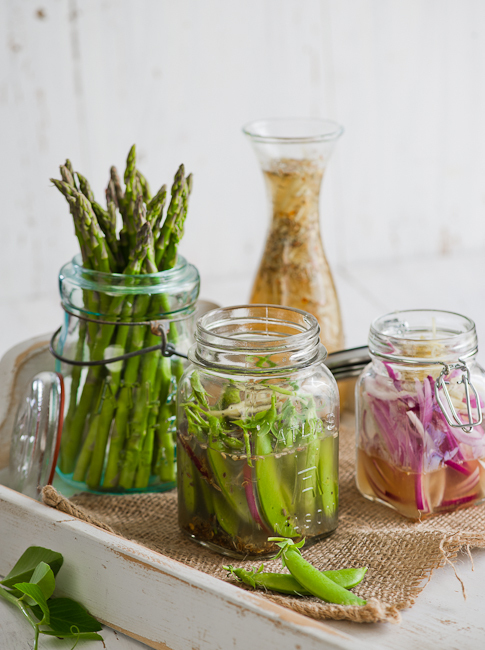 I’m planning on trying pickled asparagus this weekend – can’t wait to give this recipe a go! 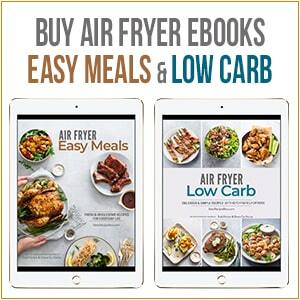 Hi, just found your site and was fascinated by your photography alongside with your recipe. Pickling is one favorite of mine. I do them too from time to time as i don’t find eating my meal complete without pickled goodies. I’ll try your recipe one of these days and for sure my visits here will be frequent. Great blog! You can never have too many Walla Walla Sweets! I love pickles, I love pickles, I LOVE PICKLES! Pickled anything. As a kid, we would get to spend two glorious weeks at my grandparents home in North Carolina. As girls, my grandmother would put us to work with some of the gardening, but mostly, cleaning and prepping the veggies. I watched her pickle and can everything. I can imagine if it was something I had to do all the time, I might complain, but I loved it and I know, as you know, how lucky we were to have such caring parents and grandparents to share their bounty with us, and good clean food with us. It made me who I am today and I still can and pickle every fresh veggie I’m lucky enough to get from my gardening friends. I can’t wait to try this recipe! And thanks for inspiring URB w/green mango pickles…. oh yeah, I’m headed to the Asian market this weekend and they’ll be some mango pickling going on too! inspiring post and photos! THANK YOU FOR YOUR PICKLING SUGGESTIONS! Wonderful childhood story! I’m a big fan of pickles too. My grandmother picked cucumbers out of her garden then soaked them in a bowl of apple cider vinegar and salt and we ate them with meals. A sort of faux pickle I guess. Thanks for the recipe. 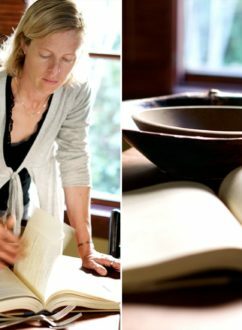 Diane, those are gorgeous photos and thanks for the simple pickling recipe! As a lover of all things pickled, I wonder if you have ever come across “senf gherkins”. Growing up in the Midwest in a Danish household, we always had these bright yellow “pickles” around. They weren’t really pickle like, more like watermelon rind slices without the green skins. My great grandmother would buy jars of them in the grocery. But by the 1970’s they’d vanished. I’ve tried watermelon pickles but they weren’t it. Even searched Danish cookbooks but to no avail. So just taking a shot in the dark here to see if perhaps you or any of your readers had ever heard of or better yet tasted them. They weren’t dilly or sweet hamburger types, nor were they hot but had a sort of a sweet vinegar turmeric taste. We’ve never heard of those type of “pickles”. Hopefully someone will know more about them and comment. We’d love to find out more as well! I have a question about photography tabletop “sets”. I am wanting to try to find different tabletops to set up shots. I have no idea where to start looking for things like this. What do the both of you do to get all the different surfaces and backgrounds that you do? We just keep out eye open for great textures. Sometimes it is a bench, floor, edge of a chair, pieces of flooring , fabric, old table, concrete… We often aren’t shooting on an actual table. We’ve know photographers to make a print out of good textures to mimic marble or something else, but we’ve yet to try that approach. One of these shots was on a sheet of paneling we cut down and painted. We have several panels we’ve created with different textures or pieces of flooring glued onto to make easy “tabletops”. Hope that helps. Beautiful!! 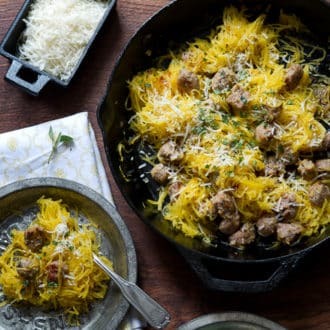 You’re photos made my mouth water! 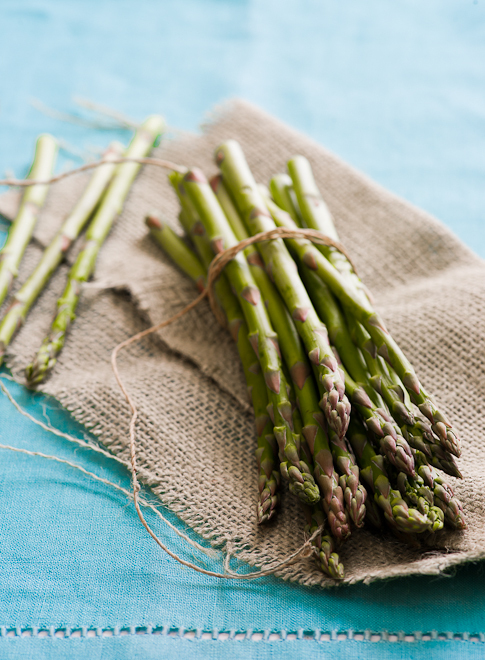 I can’t wait to try this brine recipe with our fresh farm asparagus! I’m also a pickle addict…! And also agreed that is a fabulous book. First. Wow. I can’t believe I haven’t found your blog sooner, It is absolutely fabulous. These pickles look fresh and yummy, I can’t wait to try them out myself. I’m totally blog-rolling you guys… travel, food, photography, and love are my favorite things and the best material to distract myself with this lovely afternoon (…that I should be writing a paper on the Nicaraguan revolution!). Great story to go along with your beautiful photos. I can imagine the mutinous calls when the Atari was revoked in favor of pickling. I haven’t attempted pickling or canning yet, I really want to but I find it a little intimidating. Your pictures are gorgeous, I would love to give this a try. I LOVE, LOVE, LOVE pickles! 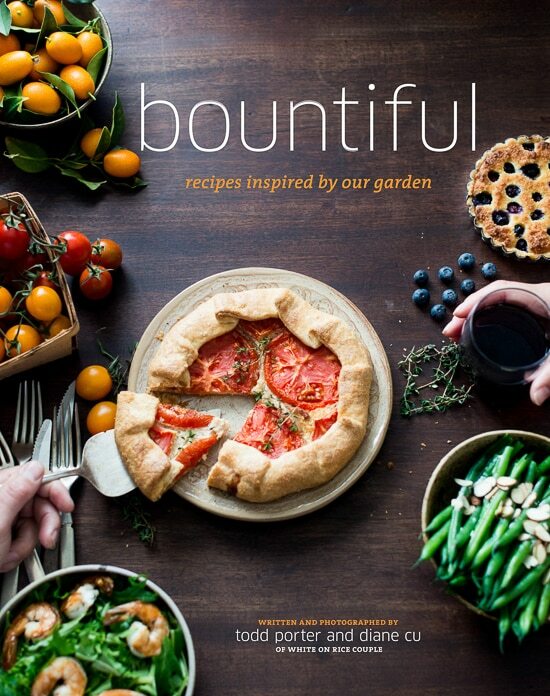 I pickle everything, it’s a great way to use up extra vegetables, and with spring here, it’s perfect – This sounds like a great book, and recipe! Thanks for sharing. How gorgeous!! I could sit and browse through your site all day, it’s so beautiful. Lovely recipe!! Have a great Monday friends! Isn’t funny how things come full circle?! My childhood sounds parallel to yours Diane in the food chore department. I remember dreading picking pie cherries from our trees which always seemed to fall to the kids as ‘slave labor’ for both picking and pitting. Now of course I’d love to have a cherry tree and go to farms to pick myself! We did the pickles too. Love your photos as always and cannot believe you have gorgeous things to pick already. I’m awaiting snow today in Colorado and contemplating building up the garden soil in anticipation of planting in June! 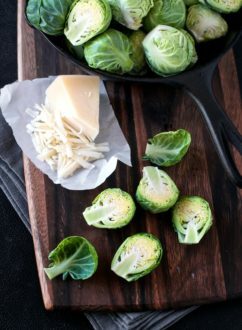 I love the use of ginger in this recipe, and I can’t wait to try it on the first spring vegetables. I have been obsessed with pickling for the last year and a half, and there is something so satisfying about a crunchy pickled green bean or asparagus spear. Love that you used peas. I’ll have to add them to my list. I’m slowly working my way up to canning and pickling. It makes so much sense with our short growing season but haven’t over come my botulism fears yet. Fridge pickles would probably be a good place to start. Sounds like mom instilled great work ethics in you. I haven’t tried pickling yet but ya never know! Oh my gosh – Pit Fall? Frogger? I can’t even remember the last time I thought about those games! Or the number of times I fell off the rope onto a waiting alligator 🙂 I’ve never thought about pickling anything beyond cucumbers. 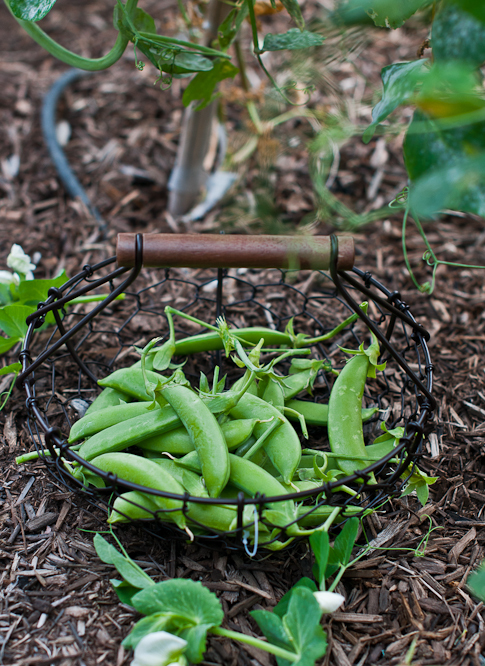 I can’t wait ’til we’re knee deep in peas in a few weeks to give this a shot!